I wasn’t able to arrange a return on Monday arriving Tuesday as planned. My company requires me to be back at the office Monday morning. I leave about the same time as my family after a tearful goodbye from my Austrian family which will continue buying wine from local wineries until later this afternoon. 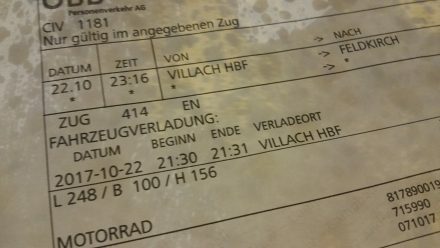 My destination for today is Villach – one of three destinations served by daily car-trains from Feldkirch. At 172 km, my trip today is rather short and involves me crossing through Slovenia again. I think it’s very obvious to regular readers of my blog that I like Austria very much. Every time I leave, I do so with a sad feeling that it will be up to a year again, until I will be back again. On the plus-side today is Villach, a city I haven’t visited for the last 25+ years. Rather cold and windy, my drive today starts with the canopy firmly attached. It’s a stark contrast to the big blue skies and brilliant weather we’ve had for the last few days! Driving alone is always a meditative affair – after just a few km I’m at a zen level and my brain switches to travel-mode. Today’s weather deteriorated sharply after climbing the hills between Austria and Slovenia – driving through low-hanging clouds and heavy rain has a very marked impact on my driving pleasure. More so as the climb combined with the heavy rain has let a lot of water enter the inside of my TWIKE and is now fogging up my windscreen. 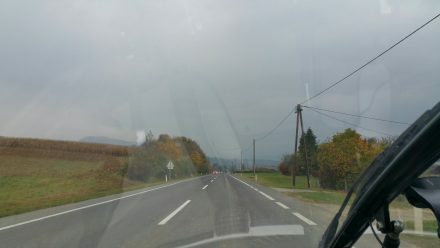 The time I had allotted for stops, photos and a tasty Slovenian lunch were promptly not used, since I, cold and no longer much enjoying my drive, just pressed on to Villach. Eventually, in torrential rain, I reach Villach late afternoon. 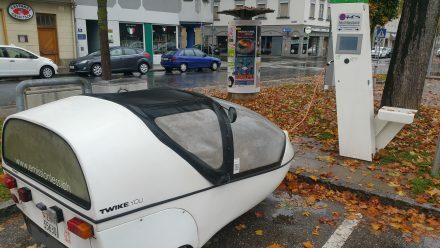 Charging was free and easy since I had requested a so-called “Lebensland” card from Tirol prior to my trip. 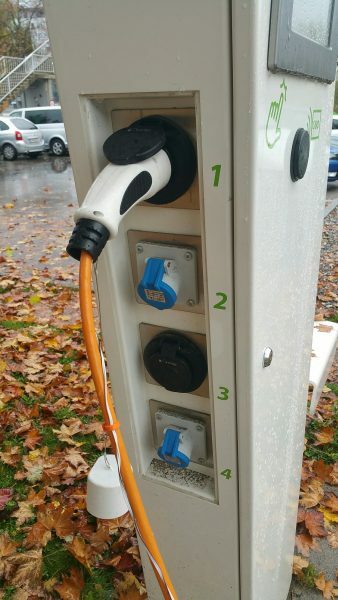 (Test-mode with free charging) I really appreciated the effort to provide barrier-free charging to non-Type2 cars by providing 1P/CEE16. Later that evening, I had a very tasty dinner at a local restaurant just mere metres away from Feldkirch’s main station. 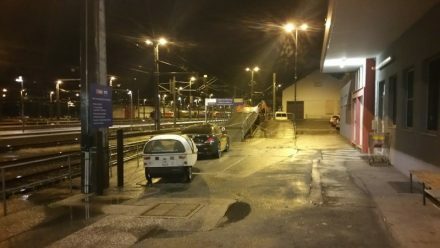 After finishing my meal, I drove my TWIKE to the designated ramp for my train. Whilst I’m eternally thankful to Austria’s Öbb for providing a car-train service active year-round, whilst everywhere else in Europe alternative train services have been in terminal decline and subsequently were canceled, I can’t stop wondering how long this service will be kept alive. The price is already prohibitively high if you want to have any kind of comfort – I can’t think of many scenarios where a cheap flight and rental car is more expensive than what I’m doing right now. 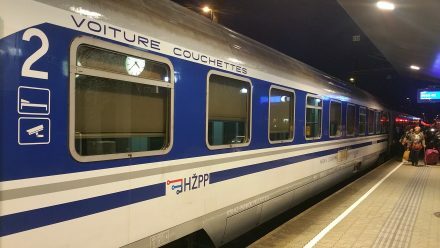 In summer, I totally get why these trains make sense: You want to take your old-timer to far-away places and not subject them to 1000-km motorway trips – this is how you can keep the mileage down and still go places! For me and my TWIKE, not so long ago, at 60km range, it was a pleasure to be able to drive in Vienna without a 10x-recharge marathon to get there! Unlike last time, getting on to the train with my TWIKE is no problem at all – everyone listens carefully to my instructions on how to strap TW560 into place and make sure that everything is ok.
After having arrived in Feldkirch at 7.30am, I drive to Zürich directly (unlike older days) and start my day with a meeting at 9.30am. 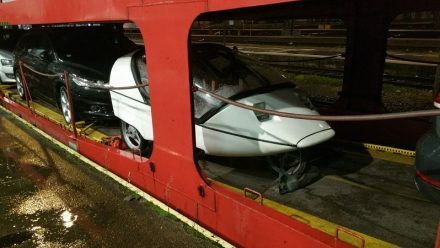 This has been – again – a brilliant TWIKE adventure. I’m looking forward to my next trip!